BORN IN HOLLYWOOD, CA, JOE GREW UP IN THE SAN GABRIEL VALLEY NEAR PASADENA. SPENDING HIS FORMATIVE YEARS IN PRIVATE SCHOOLS GAVE HIM A WIDE AND VARIED WORLD VIEW. JOE DISCOVERED HIS SCOTTISH ANCESTRY TOWARDS THE END OF HIS HIGH SCHOOL CAREER, BUT DID NOT REALLY BECOME INVOLVED IN THE FESTIVAL/HIGHLAND GAMES SCENE UNTIL HE BEGAN DOING EVENT SALES FOR UTILIKILTS, WORKING MOST OF THEIR EVENTS IN SOUTHERN CALIFORNIA AND BECOMING FURTHER ENTRENCHED INTO HIS HERITAGE AND THE FAMILY ATMOSPHERE THE SCOTTISH AND CELTIC COMMUNITIES PROVIDED. AFTER 5 YEARS ON THE VENDING SIDE, I WAS TALKED INTO TRYING SCOTTISH HEAVY ATHLETICS. JOINING HIS LOCAL PRACTICE GROUP, THE ORANGE COUNTY HIGHLANDERS, HE WAS QUICKLY HOOKED ON THE SPORT AND CAMARADERIE THAT COME WITH IT. 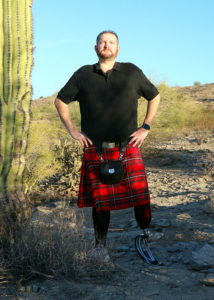 RIGHT BEFORE HIS FIRST GAMES, HE SUSTAINED AN INJURY AND WAS NOT ABLE TO COMPETE, BUT BECAME TRAINED AS AN OFFICIAL, AND AFTER 4 YEARS WAS ELECTED AS VICE PRESIDENT OF THE SCOTTISH AMERICAN ATHLETIC ASSOCIATION (SAAA), AND ALSO SIT ON THE BOARD OF THE KILTED ATHLETE SOCIETY OF AMERICA (KASA). AS SOME OF YOU MAY KNOW, MY JOURNEY INTO BECOMING AN ADAPTIVE ATHLETE STARTED WITH A TRAGIC ACCIDENT. ON JULY 14, 2012 I WAS INVOLVED IN AN AUTO VS PEDESTRIAN ACCIDENT WHILE ON VACATION IN SAN DIEGO. THE NEXT 2 YEARS INVOLVED MY DOCTORS AND I TRYING TO SAVE MY FEET, THE FINAL RESULT BEING THE AMPUTATION OF THE 5TH TOE OF MY RIGHT FOOT IN JULY OF 2013, AND THE BELOW KNEE AMPUTATION OF MY LEFT LEG IN JULY OF 2014. THE OUTPOURING OF LOVE AND SUPPORT FROM THE THROWING COMMUNITY, MY FRIENDS, AND FAMILY WAS BEYOND AMAZING. I HAD PEOPLE THAT I HAD NEVER MET BEFORE STEP IN AND MENTOR ME, QUICKLY BECOMING FRIENDS THAT I WILL HAVE UNTIL WE SHED THIS MORTAL COIL.